Rhian Brewster’s dad was at hand to pay a special tribute to his son after Saturday’s World Cup triumph. Ian Brewster has explained how he messaged the Liverpool striker shortly after the victory with a picture of Rhian’s face photo-stopped onto that of Bobby Moore in the famous image from the 1966 World Cup. England’s U17s came from two goals down to beat Spain 5-2 in a dramatic final to match the achievement of the U20s earlier this summer by becoming world champions. 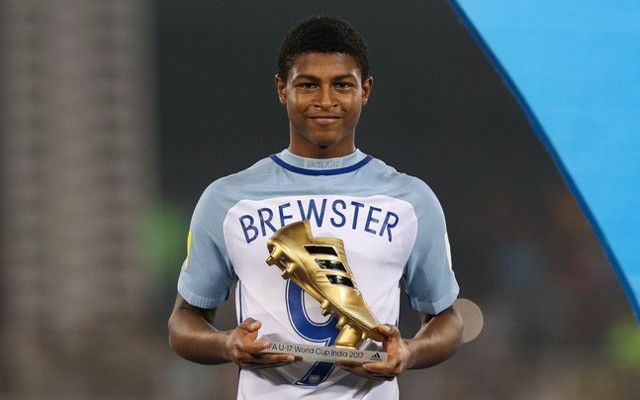 Brewster himself yet again made the headlines as he scored his eighth goal of the tournament to secure the Golden Boot. Brewster was in sparkling form throughout the competition, registering consecutive hat-tricks in the two games leading up to the final. The 17-year-old was rewarded for his swift progress towards the beginning of the year when he was promoted to Liverpool’s U23s team, where he has since consolidated a spot under Neil Critchley. He also reached the final of the European U17 Championships in May where England were unfortunate to lose to Spain, before helping his country get revenge in Saturday’s corresponding matchup. The future is looking incredibly bright for a young man who continues to impress with his level-headed approach and sheer commitment to putting in the hard work- perhaps even more so than with his prolific goal-scoring.